Blue Origin's Goddard demonstration vehicle in mid-flight above its West Texas launch pad during a test launch on Nov. 13, 2006. In the entrepreneurial space business, there's nothing like the "cone of silence" surrounding the rocket work of billionaire Jeff Bezos of Amazon.com fame. In hush-hush surroundings, the Bezos Blue Origin business plan has been resolute in developing its New Shepard, a vertical takeoff and landing rocket. The plan: To develop a craft that can routinely fly multiple astronauts into suborbital space at competitive prices. 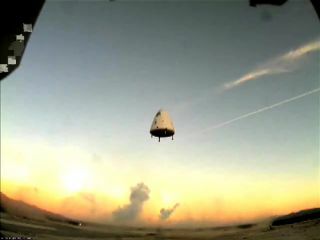 Flight tests of an Origin-class suborbital craft have been staged at a Bezos-bankrolled private launch site in Texas. That much is known ... and beyond that, little is known in any great detail. Today, Blue Origin announced that it has picked three research payloads to fly on the New Shepard suborbital vehicle. That trio of experiments – to be shot high above Earth – is part of Phase 1 of the New Shepard Research Flight Demonstration Program. Three-Dimensional Critical Wetting Experiment in Microgravity by principal investigator, Stephen Collicott, of Purdue University. Microgravity Experiment on Dust Environments in Astrophysics (MEDEA), to be done under the eye of Joshua Colwell of the University of Central Florida. Effective lnterfacial Tension lnduced Convection (EITIC), with the principal investigator identified as John Pojman of Louisiana State University. "These payloads were selected from an excellent field of submitted proposals," explains the Blue Origin web site. According to Blue Origin, the suborbital hops of these experiments is planned to begin "in the coming years" to demonstrate the integration and operation of scientific experiments into the New Shepard system. In the big scheme of things — in terms of suborbital experimentation — there is a growing competitive movement to lob payloads, people, as well as people and their payloads on suborbital jaunts. Firms such as the XCOR Aerospace Lynx, Scaled Composite's SpaceShipTwo, as well as the Blue Origin's New Shepard are pulsing investigator interest in flying suborbital experiments. NASA is also engaged in evaluating what vehicles may give them an edge on flying to the edge of space. Meanwhile, the public relations-shy Blue Origin group's New Shepard will consist of a pressurized Crew Capsule carrying experiments and astronauts atop a Propulsion Module. Flights will take place from Blue Origin's launch site, which is already up and operating in West Texas. New Shepard is being designed to take-off vertically and accelerate for roughly 2.5 minutes before shutting off its rocket engines and coasting into space. In space, the Crew Capsule would separate from the Propulsion Module and the two re-enter and land separately for re-use. As blueprinted by Blue Origin, the Crew Capsule lands softly under a parachute at the launch site. Astronauts, as well as tote-along experiments, will experience no more than 6 g acceleration into their seats and a 1.5 g lateral acceleration during a typical flight. High-quality microgravity environments, according to Blue Origin, can be achieved for durations of 3 or more minutes, depending on the mission trajectory. Flight testing of prototype New Shepard vehicles began in 2006. Blue Origin has stated in the past that flight opportunities in 2011 may be available for autonomous or remotely-controlled experiments on an unpiloted flight test. The firm has also said that it expects the first opportunities for experiments requiring an accompanying researcher astronaut to be available in 2012.